Hardcover, 7.5 x 10.25 in. / 216 pgs / 138 bw. Introduction by José Lebrero. 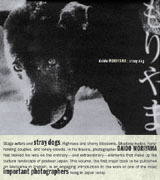 Text by Daido Moriyama. 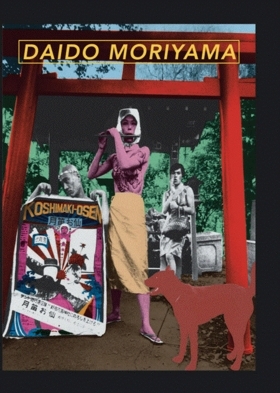 Based on the retrospective exhibition organized by the Andalusian Center of Contemporary Art in Seville in March of 2007, this stunning book offers a new look at the work of Japanese photographer Daido Moriyama. An implacable visionary of our fragmented postmodern world, Moriyama is famous not only for his stark images of urban life but also for his transformation of everyday ordinariness, the stream of perceptions that our restless sense of sight registers at every moment of our waking hours. The volume includes a widely-ranging overview of Moriyma's highly contrasted, oddly-angled black-and-white photographs, including sixteen pages printed on yellow paper, which provides a new and unexpected support for these images. The striking cover of the catalogue is the creation of noted Japanese designer Tadanori Yokoo. 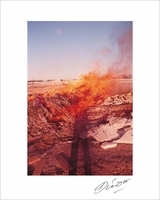 The book includes a brief introductory text by José Lebrero Stals and a penetrating essay by Minoru Shimizu, which places Moriyama's work in the context of postmodern critical theory on photography, from Benjamin to Barthes to Derrida. Finally, a moving text by Moriyama himself -"Dialogue with Photography"- describes how he succeeded in abolishing the boundaries between subjectivity and objectivity in his art to explore the relentlessly momentary nature of photographs, "fossils of light and time". Edited and Interview by Andrew Roth. Essay by Neville Wakefield. FORMAT: Hardcover, 7.5 x 10.25 in. / 216 pgs / 138 b&w.